Psychology plays an increasingly important role in today's society. Its influence can be seen all around us - be it in the home, the workplace, the school or our private lives. A uniquely diverse discipline, it ranges from social psychology to biological aspects of behaviour, and from basic research to the applied professions. 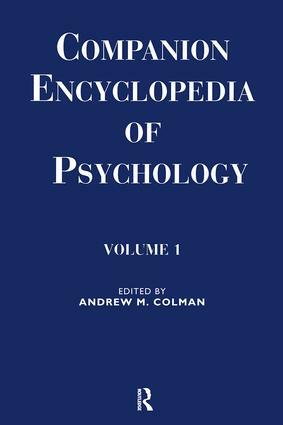 This Companion Encyclopedia covers all these main branches of psychological research and professional practice. The thematic arrangement is the result of the Editor's extensive research into syllabi, from which he distilled the 13 most frequently taught units. Students can consult and be referred to sections relating to their lecture programme, and can find lucid definitions of frequently used terms in the Glossary. Headings and sub-headings are clearly highlighted at the beginning of each chapter - ideal for quick reference. Andrew M. Colman is a Reader in Psychology at the University of Leicester, UK and is a qualified psychologist. His previous books include Facts, Fallacies and Frauds in Psychology and What is Psychology? The Inside Story. He is founder and former editor of the journal Current Psychology: Research and Reviews and has contributed over 100 articles to prestigious journals such as the British Journal of Psychology, Criminal Law Review and American Psychologist. He served for several years as Honorary Information Secretary of the British Psychological Society, and late as registrar and Chief Examiner for the society's qualifying examination.